The $16 billion acquisition of Flipkart by Walmart changes the online marketplace for India, the two companies and their main rival Amazon. reviews the deal, what it means for the three, and what’s on their wishlist. In October 2007, a Bengaluru-based non-descript start-up selling books online found itself in a spot when its first ever order was found to be out of stock with its vendors. Binny Bansal, who co-founded Flipkart with Sachin Bansal, shot an e-mail to the customer saying that the book they had managed to procure was not in the best condition. “So you have two choices: If you need it urgently then we can ship this copy itself. Or if you can wait for a week or so then we can try to procure a fresh copy for you. In either case, we’ll give you a 10 per cent extra discount for your troubles,” Binny wrote to V V K Chandra, who ran a freelance web-consultancy out of Mahabubnagar, 90 km outside Hyderabad. More than a decade down the line, the start-up that began its journey in a small two-bedroom flat at Koramangala, Bengaluru, is poised for one of the biggest leaps India has seen, after acquisition by Walmart Inc in a $16 billion deal, making it the country’s biggest M&A (merger and acquisition) and the largest for the US-based retail giant. It also brings Flipkart and Walmart together against a company that is proving to be their biggest rival in their respective home territories: Amazon. Even though the 10 per cent discount offered by Flipkart on its first order was more a goodwill gesture than a marketing move to drive sales of the company, discounting has been an important tool used by e-commerce companies in India to expand the market and push adoption of online buying. For this, the companies have even lapped up losses year after year. Over the last three years for which latest data is available, Flipkart’s losses grew from Rs 2,583 crore in 2014-15 to Rs 8,771 crore in 2016-17, according to filings made with the Accounting and Corporate Regulatory Authority, Singapore. But while the bottomline has gone further in the red, primarily on account of marketing expenses, the topline (sales, revenue) has also nearly doubled. From Rs 10,246 crore in 2014-15, this expanded to Rs 19,854 crore in 2016-17. With Walmart’s support, Flipkart will now begin to enjoy a privilege that Amazon has been getting from its parent company in the US. Amazon founder and CEO Jeff Bezos has time and again reposed faith in India and said that investment in the Indian business will be made as and when needed. Analysts have pointed out that the constant problem about raising funds to keep competing with Amazon will be off Flipkart’s table now, which could lead to the e-commerce firm focusing more on driving business and profitability. While ratings agency Fitch has said that Flipkart would need incremental cash infusions, and that it did not expect it to break even for at least five years, Walmart has indicated it is willing to wait. In its press release announcing the deal as well as in a call with analysts, Walmart has said it remains bullish on Flipkart (as do its other financial investors), and that it expects Flipkart’s losses to decline as “business scales and efficiencies are realised”. One of the key strengths of Flipkart, behind its phenomenal growth, is the online retailer’s understanding of the Indian customer. In 2010, the company pioneered the cash-on-delivery model that proved to be essential in a market where the trust factor with online shopping was low and where a customer was happier paying after being fully satisfied with a product. Cash on delivery now has a 51 per cent share of the entire e-commerce market. With urban markets saturated and e-commerce companies heading into Tier-II and lower-category towns, this mode of payment is expected to become even more popular. Since the explosion in data consumption in the past 18-20 months, the online retail segments, like other businesses in the consumer Internet sector, have witnessed exponential growth in smaller areas. In 2017, for the first time, the number of online shoppers from Tier-II and lower-category towns exceeded those in metro cities — 37 million compared to 36 million. Walmart has said that as it scales in India, it will support small businesses through direct procurement as well as through global sourcing and e-commerce. “Among other initiatives, Walmart will partner with kirana owners and members to help modernise their retail practices and to adopt digital payment technologies,” the company said in a statement on Wednesday. Compared to their metro and Tier-I counterparts, the Tier-II and lower shoppers have lesser disposable income for online shopping and are unlikely to be enticed into the subscription-based model, which makes more economical sense for regular buyers and which has proved successful for Amazon. Further, Flipkart, through its own logistics firm Ekart, has managed to reach farther corners of the country as compared to Amazon. Ekart covers 35 per cent of around 20,000 pin codes in India, while Amazon Transportation Services covers 28 per cent, as per Bengaluru-based research firm RedSeer. These companies also use a number of other logistics partners, including India Post, to deliver to areas they don’t cover themselves. The RedSeer data is the latest available for the business, sourced from the consultancy firm’s presentation to the media on Thursday. Under CEO Kalyan Krishnamurthy, Flipkart has also managed to to look beyond discounts and strengthened its foothold in categories such as smartphones, fashion and apparel. The acquisition of Myntra and Jabong helped Flipkart consolidate its position in the fashion segment, taking it to the top of the heap. As for countering Amazon on technological capabilities too, Walmart could open doors for Flipkart. Walmart has said it is in discussions with potential investors to participate in funding for Flipkart, which could see its own stake falling by the time the deal is closed. One of those investors could be Google’s Alphabet, which could pick up to 15 per cent stake, for $3 billion. Alphabet would get Flipkart additional strengths in terms of data analytics and market intelligence, apart from Google’s huge data base built over a number of projects and years in India. It won’t be the first time either that Walmart would team up with Google to battle Amazon. Last August, the partnership saw Walmart offer a variety of its products for order through voice shopping via Google Assistant. 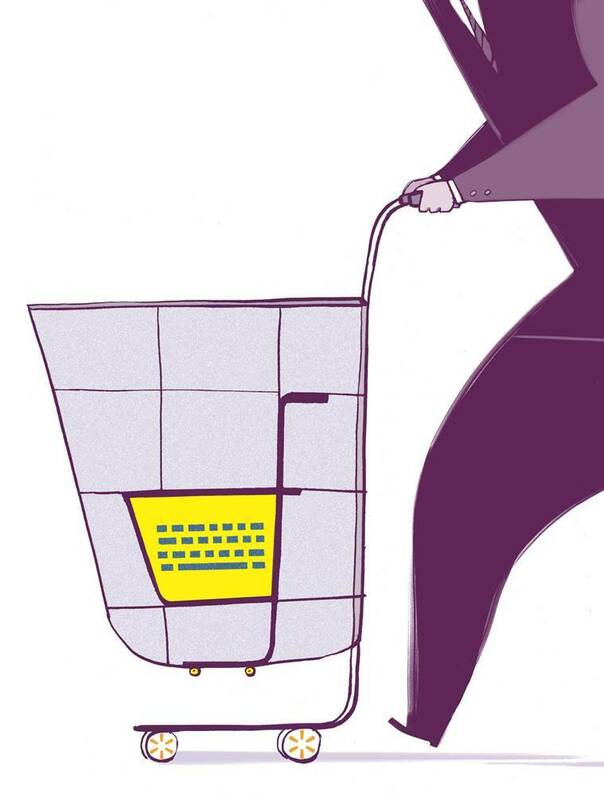 This enabled Walmart to deliver personalised shopping recommendations based on customers’ previous purchases, including those made at Walmart stores and on Walmart.com. Alphabet and Walmart did not respond to requests for comment on the Flipkart deal. Notwithstanding another strategic investor joining Walmart to acquire Flipkart, it will continue to hold the majority stake. Flipkart, on its part, will continue to remain a board-managed company, as confirmed by Binny Bansal, and will not be run from Bentonville, Arkansas, where Walmart is based. Walmart has even agreed to support Flipkart’s plan to eventually become a publicly listed company. If Flipkart gains from both the cash infusion and the operational expertise of the Walmart behemoth — which runs over 11,700 stores under 65 banners in 28 countries, plus e-commerce websites — the deal helps Walmart address growth issues against a growing Amazon footprint in the US. While Walmart’s net sales are still several times Amazon’s, the ‘Beast of Bentonville’ has been slowing down. For the 12-month period ending January 31, 2018, Walmart clocked net sales of $495.8 billion, compared to $466.1 billion for the same period in 2013. Walmart’s market capitalisation has also seen slow growth, from $202 billion as of end-2012 to $252 billion now. While unlike Walmart, which is a retailer, Amazon remains primarily a technology company, involved in online retail alongside cloud computing and content-on-demand services, it has seen its net sales almost triple from $61.1 billion for calendar year 2012 to $177.9 billion for 2017. Its market capitalisation has similarly surged from $117.9 billion as of end-2012 to $773.2 billion currently. From an investor’s point of view, it would appear that Walmart has placed all its India eggs in the Flipkart basket. The announcement that it was putting $16 billion in a loss-making business, facing intense competition from Amazon, in fact, sent jitters across Walmart’s investor community, with $10 billion wiped off Walmart’s market capitalisation in the US shortly after. However, Walmart’s decision has to be viewed in the light of its limited success so far in the cash and carry business in the country. After it entered the Indian retail space in 2007 and started operations in 2009, Walmart India did not make any profit till 2016. In fact, its accumulated losses between December 2009 and March 2016 were Rs 1,874 crore. Currently, the company owns and operates 21 cash and carry stores under the Best Price brand, with plans to open 50 new stores over the next four years. Walmart operates through the wholesale model primarily due to the Indian government’s reluctance to allow foreign direct investment in multi-brand retail, the same as Germany’s Metro Cash & Carry and French Carrefour — thereby limiting their presence in the retail segment. The Indian e-commerce sector is also restricted because of the government allowing FDI only in the marketplace model, effectively not letting platforms hold their own inventory. This is believed to impact the level of customer satisfaction, particularly when online retailers are dealing with thousands of sellers across the country along with cancellations and refunds (which constitute over 30 per cent of all orders). “With the acquisition of Flipkart, Walmart will be able to extend its expertise in managing physical goods to the digital world — a strength that Flipkart lacks. To put this in context, supply chain is also the strength of Amazon. This strength, we believe, is a significant differentiator in a marketplace dominated by thin margins and worsened by steep discounting policies,” says Sanchit Vir Gogia of technology consultancy firm Greyhound Research. In one way, the Walmart-Flipkart deal is a proof of the giant strides made in India by Amazon. It started operations only in 2013 — six years after the Bansals, incidentally its former employees, set up Flipkart — and with a modest investment of $5 billion. But in just five years, it is at the top of the e-commerce market, at the expense of various Indian firms such as Snapdeal. As far back as 2015, a study had found Snapdeal, then second only to Flipkart, with 21-23 per cent of the market share, ceding ground fast to Amazon. From 17-19 per cent share at the time, Amazon is estimated to be up to 30 per cent in calendar year 2018, as compared to Flipkart’s 46 per cent, as per RedSeer. 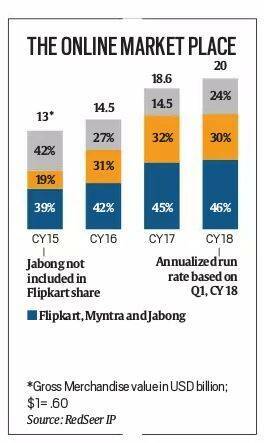 Flipkart’s market share for 2018 incidentally includes its acquisitions Myntra and Jabong. Experts point to Amazon’s control of its entire supply chain ecosystem and focus on high-value customers as key to its success. Through its 34 ‘Fulfilment Centers’ — packaging and delivery houses — Amazon keeps a close watch on each and every stage of delivery once an order has been placed, ensuring a satisfied customer. Besides, Amazon’s subscription model through its Prime offering has allowed it to tap into a high-spending loyal customer. Research by RedSeer estimates that around 35 per cent of Amazon’s orders are coming from Prime members. And that an Amazon Prime customer (who now pays Rs 999 annually) spends 1.9 times and shops 2.1 times in a year compared to a non-Prime customer. Further, it estimates, 22 per cent of the Prime members have not shopped on other platforms after subscribing to the service. “Other companies are expected to come up with similar strategies to increase customer loyalty on their platforms,” RedSeer says. However, if it has to sustain its hold, especially now, Amazon must evolve a strategy to tap the low-income segments of the Indian market. Interestingly, Amazon too was reported to be in talks to pick up a majority stake in Flipkart. Since Walmart beat it to it, the firm has maintained complete silence on their deal. With the deal, Flipkart has seen a number of its older investors walking out with more moolah than they pumped in to the company. Japanese Softbank, which was one of the biggest stakeholders with over 20 per cent Flipkart shares, made nearly 1.5 times its $2.5 billion investment, committed only eight months ago. Softbank is reportedly rethinking its decision to exit Flipkart. An India spokesperson for the Japanese firm declined comment on this. South African technology firm Naspers is set to make over $2.2 billion for a total of $600 million invested by it in Flipkart since 2012. US-based online marketplace eBay, which invested around $500 million in August last year, said it would make around $1.1 billion. Experts too agree that the Flipkart-Walmart deal changes the Indian startup ecosystem. “The only apprehension that a startup or a venture capital fund had to address in India was that India had never demonstrated a mega cash-for-cash exit at a decent multiple. Now these investors will have some faith that even India can produce startups that have a global-level scale and exits of this size are possible,” says Sunil Goyal, founder of early stage investment fund YourNest.